Let’s say you go to an expensive restaurant with limited money in your wallet. You’re intimidated by the foreign words on the menu and pick the first thing that’s on there. You might end up with a delicious meal, or end up with a terrible dish and a hungry stomach. What if, instead, you go to the restaurant with a group of your friends, and you decide to pool your money together? Your chef friend Lisa picks the dishes, and everyone has some of each dish, without having to pay for every item. Doesn’t that sound perfect? This is the very essence of mutual funds. A group of investors pool their money, which is then invested into a basket of securities by a professional fund manager. You get a piece of everything in the basket, without having to buy each item. The fund invests in a varied basket of securities. Even if a few stocks go under loss, they are typically offset by the returns from the rest of the securities. Mutual funds can give us exposure to different asset classes. The key thing to note is that mutual funds give the best returns over the long run. By staying invested through for long periods, we can get exponential return on investment due to the power of compounding. Mutual funds are easy to redeem. When in need of cash, the mutual funds can be sold and the money credited to our accounts in 1-2 business days. You don’t need much money to invest. Mutual funds accept investment as low as ₹500. With the introduction of SIPs, investors can invest a small amount into mutual funds at periodic intervals. Mutual funds are managed by portfolio managers with years of experience who dedicate their time towards ensuring the best risk-return trade-off to the investors. They put their knowledge and expertise to work to identify the best investment avenues. Mutual funds come in all shapes and sizes – debt funds for the risk averse, index fund for the moderate risk takers, thematic funds for the aggressive investors. No matter your investing style, you can find a mutual fund to match it. Mutual funds charge a fund management fee, also called the ‘Expense ratio’ on the invested amount. Expressed as a percentage, it is an annual charge on our investment. Regular plans have higher expense ratios than direct plans as they include annual commission to the distributor. Some mutual funds also charge exit loads on redemptions within a certain window. 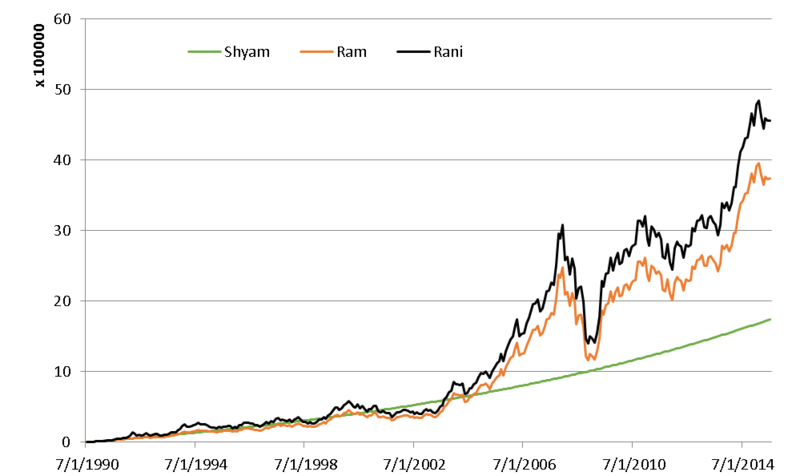 Mutual Funds, especially equity funds, dont go up in a straight line. Investing in Mutual Funds requires longer time horizons and an ability to ride out periods of underperformance or even mark to market losses. The rewards for sticking through the investment for long is higher returns than traditional bank saving products. Some funds like Tax Saving ELSS have lock-in periods of 3 years. There are also funds (called close-ended funds) that can only be bought and sold between a certain window. An investor needs to be aware of such clauses before investing. Mutual funds are fast becoming the go-to option for retail investment. With Direct plans gaining prominence and SEBI cutting down the expense ratios of funds, mutual funds are better than ever. Whether you’ll invest in mutual funds or not, you’ll now be armed with information about their pros and cons, allowing you to take informed financial decisions. Niveditha Vishwamithra is an Analyst at Kuvera.in: India’s first completely free Direct Mutual Fund investing platform. Start investing through a platform that brings goal planning and investing to your fingertips. Visit kuvera.in to discover Direct Plans and start investing today.